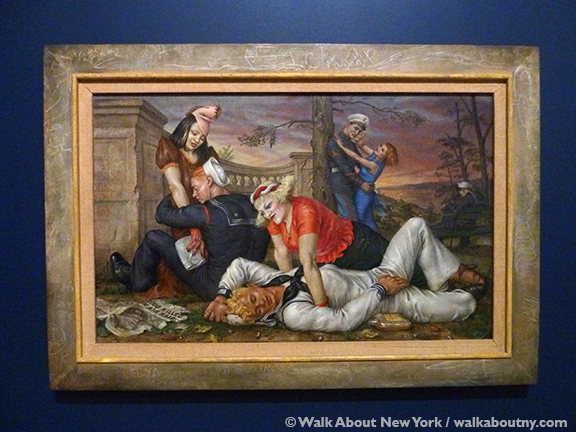 —Paul Cadmus (1904–1999), his response that “Sailors and Floozies” was an offensive portrayal of U.S. Navy sailors. As of 2015 New York’s Whitney Museum of American Art has a new home. It has returned to its roots, Downtown Manhattan. The Museum was founded by Gertrude Vanderbilt Whitney (1875-1942) at Eight West Eighth Street in 1931. Although the new location is further west and to the north, it has left the confines of the corporate office towers on Madison Avenue in Midtown for what has become known as the Meat Packing District. The Whitney is directly next to the entrance to the High Line, New York’s elevated park that has become a magnet for those seeking to stroll a former railroad trestle and get a different perspective on the cityscape. Mr. Cadmus includes telling details: the empty bottle of alcohol and the placement of the sailor’s right hand. During an early July visit to The Whitney some works of art caught my eye. Over the next few weeks a series of articles will highlight those artworks. The first one is by a New York native, Paul Cadmus; his work was brought to my attention by a friend in the early 1980s. I have had a keen appreciation of it ever since. A serviceman by himself slumps on a park bench in the shadows. Sailors and Floozies was painted in 1938. When it was first exhibited so-called patriotic, government officials in the guise of art critics pounced! They were upset by what they saw as a seedy, revolting, and most importantly unpatriotic depiction of U.S. servicemen. Surprisingly, the homoerotism—a running theme in Mr. Cadmus’ work—did not concern them. Perhaps they did not recognize it hiding in plain sight! Instead the critics objected to carousing, drunken U.S. Navy sailors. More telling details: the front page of the New York Daily News sets this scene squarely in historic perspective. Even crumpled it is possible to recognize the face of Mussolini on the paper’s front page. It is a brilliant touch! Mr. Cadmus painted what he had seen. As a teenager he would frequent Riverside Park, bordering the mighty Hudson River on Manhattan’s west side. He witnessed just such behavior there. Maybe adding insult to injury, the scene is set at the Soldiers and Sailors Memorial at West 89th Street in Riverside Park, one of the City’s unsung urban green spaces. Mr. Cadmus designed the picture’s wood frame as well; he continued the graffiti from the memorial onto the frame, creating a complete set piece. Not all the servicemen are member of the U.S. Navy. Here a U.S. Marine gets fresh with a floozie; she rewards him with a slap. The relationship between each couple is compromised in some way. I always take notice of a work of art’s provenance, its backstory, where it came from before it was owned by a museum. In this case, the person who donated Sailors and Floozies to The Whitney was Malcolm S. Forbes (1919–1990). This oil and tempera on linen painting was one of several works by Mr. Cadmus that was owned by Mr. Forbes, publisher of the capitalist’s tool, Forbes Magazine. The reclining sailor, wearing his dress whites, is a dozing Adonis; Mr. Cadmus was strongly influenced by Italian Renaissance art, which in turn took its lead from ancient Roman and Greek art. In 1940 Sailors and Floozies was scheduled to be part of the Golden Gate International Exhibition in San Francisco; but the U.S. Navy did not want it included. The press cried, “Foul!” saying government had no place playing art critic; the painting remained a part of the show. This was not the first time that Paul Cadmus’ work faced government censorship. Learn what sailor-themed work of his was pulled from an art exhibit in Washington, D.C. when you take our Gay Village Walking Tour. Paul Cadmus and Malcolm Forbes are featured personalities on that Tour. Discover where they lived in Greenwich Village, New York’s most storied neighborhood, and much more about The Village, gay and otherwise.